Is an ACL tear more common on artificial turf or grass? The following question is one I received from a long-time listener of my show and someone who frequently comments on the discussions in social media. Since his question involves a topic that requires a complex explanation, I am breaking my answer up into a blog post and a discussion during the In the Zone segment of Episode 74 of The Dr. David Geier Show. I’ve enjoyed reading your articles, following you on Facebook/Twitter and listening to your shows on podcast. I really appreciate how you express how important athletic trainers are in the sports world. I work at a local high school with 800+ athletes and have very little support from my AD and coaches. But we just started the program so it is slowly building. My question for you is do you think playing on turf field compared to regular grass has an impact on injuries? Our varsity football team practices on grass field and play more than half of their games on turf. We had 3 meniscus injuries on the turf fields. Two were medial and one lateral; all 3 were repair. Also had a tibia/fibula fracture without impact. When asking the injured kids what they thought about the turf they all said it feels like their cleats stick into the ground. Thanks Gino for the question and the thoughts on the show and social media. It means a lot. I actually like your question and think that there is a lot of information worth discussing. It would be too much for one blog post, so I am going to break up my thoughts. Here I want to address knee injuries – and ACL injuries specifically – and their incidence rates on natural grass compared to turf. In my next podcast, I will discuss a variety of injuries and discuss the effect of the surfaces and other related factors on injuries. I looked for studies comparing knee injuries as a whole that occurred in football on FieldTurf and natural grass. If the studies offered data specifically for ACL injuries on the different surfaces, I included them as well. I will basically compare grass to FieldTurf rather than older-generation artificial turf, as the newest infill surfaces seem to be replacing their predecessors. In a study performed by the National Football League Injury and Safety Panel, published in the October 2012 issue of the American Journal of Sports Medicine, Elliott B. Hershman et al. reviewed injury data from NFL games played between 2000 and 2009. They found that the injury rate of knee sprains as a whole was 22% higher on FieldTurf than on natural grass. While MCL sprains did not occur at a rate significantly higher than on grass, rates of ACL sprains were 67% higher on FieldTurf. 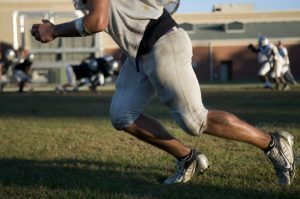 Risk factor for ACL tears in college football? Dragoo et al. reviewed the National Collegiate Athletic Association Injury Surveillance System for injuries between 2004 and 2009 to attempt to identify risk factors for ACL tears in college football. In their study, published in the May 2012 issue of the American Journal of Sports Medicine, they observed that rates of ACL tears were higher on artificial turf than on natural grass. When they isolated infill turf surfaces, such as FieldTurf, the ACL injury rate was significantly higher than on natural grass. It is worth pointing out that there are studies showing conflicting data. Meyers studied football injuries at 24 universities over three seasons. Comparing all injuries (and not just ACL tears), he found no difference in the rate of knee injuries from games played on natural grass and those on FieldTurf. Additionally Meyers and Barnhill studied eight high schools over five seasons. They actually found a higher incidence rate of ACL injuries on FieldTurf than on natural grass. What does all of this data mean? I tend to side with the NFL and NCAA data. The study looking at high school football might be a good one, but they only looked at eight high schools and not all NFL teams or NCAA schools. Plus it is possible that the grass conditions at high schools aren’t as good (especially at the end of a season) as those of NFL and NCAA fields. So I at least take these studies to show that ACL injury rates are at least as high – if not actually higher – on FieldTurf than on natural grass. What we don’t know is exactly why these infill surfaces might lead to more ACL tears. Is it the weather and problems with the surfaces when they get wet? Is it a problem with the interface between the players’ shoes and the turf? Is it a result of increased speed of play due to a uniform playing surface? Much more data on all of these factors in the next few years should help us answer these questions. Hershman EB, Anderson R, Bergfeld JA, Bradley JP, Coughlin MJ, Johnson RJ, Spindler KP, Wojtys E, Powell JW. An Analysis of Specific Lower Extremity Injury Rates on Grass and FieldTurf Playing Surfaces in National Football League Games: 2000-2009 Seasons. Am J Sports Med 2012;40(10):2200-2205. Dragoo JL, Braun HJ, Durham JL, Chen MR, Harris AHS. Incidence and Risk Factors for Injuries to the Anterior Cruciate Ligament in National Collegiate Athletic association football: Data From the 2004-2005 Through 2008-2009 National Collegiate Athletic Association Injury Surveillance System. Am J Sports Med 2012;40(5):990-995. Meyers MC and Barnhill BS. Incidence, Causes, and Severity of High School Football Injuries on FieldTurf Versus Natural Grass: A 5-Year Prospective Study. Am J Sports Med. 2004;32(7):1626-1638. Meyers MC. Incidence, Mechanisms, and Severity of Game-Related College Football Injuries on FieldTurf Versus Natural Grass: A 3-Year Prospective Study. Am J Sports Med. 2010;38(4):687-697. Episode 74: Is artificial turf safer for football players than natural grass? 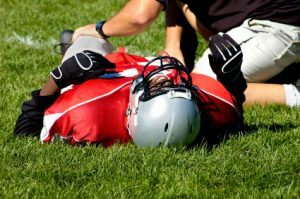 Episode 73: Is it unethical for doctors to talk about injuries of famous athletes? Would FieldTurf lower players’ risk of ACL tears?